What sets your company apart from competitors? Identify this and use it to your advantage throughout your PR campaign. This helps differentiate you from the crowd and will drive business to your brand. When starting a new business venture, it is important to know what sets your business apart from other businesses. The product or service of the business does not have to be new, but specify why the business is unique. It could be unique because of the spectacular customer service provided, or special desserts not offered in most restaurants, or the building of relationships between the client and the business. Give the potential customer a reason to spend their money and time at your business. If you’re selling a product, consider hosting a high-profile giveaway, promoted across all your social media accounts. This allows potential customers a chance to get hands-on with the product and then share their experience with the product. A business should dedicate part of its budget for promotional giveaways to help create awareness of the business. It is best to purchase promotional items that represent the business and what the business is about, such as free food samples, water canisters, polo shirts, ink pens, backpacks, and more. If business is a service, you can hand out nice post cards offering a specified percentage discount off of the customer’s first session. No matter what the promotional item is, always be sure to include the business name and/or logo. By using a Public Relations Firm, you are able to leverage their deep knowledge and expertise in helping you gain buzz for your company. Generating a buzz about your business is best done by positive word-of-mouth and social media readily available online. This is the most inexpensive way to generate talk about your business. Another option is to hire a Public Relations (PR) firm to develop a strategy to put the business name in front of the business’ target market. Journalists are looking for stories. You’re looking for coverage. Using effective Media Relations you can pitch your great idea and get major recognition. Press coverage is key to building the business’ clientele. Through positive press coverage, the business gains the trust of customers. It is an easy way to obtain public credibility. The business should aim to get coverage using the media its target market tends to use. Integrate a SEO strategy into your PR campaign to improve your brand reputation and visibility online. New businesses need to develop a strategy for Search Engine Optimization (SEO) when building plans with the PR firm. This will drive traffic to the business website when customers or potential customers type in certain key words in their online search. Try to use key words commonly used by your target market and consider including words for unique searches, like yellow diamond or purple cleats. Key words will assist in helping your business gain visibility online. Use your expertise to submit great guest blog to sites like Huffington Post and Forbes. This increases your brand’s exposure and your own involvement in the field. Post articles on relevant high-profile guest blog sites to build relationships with other bloggers and gain links. This will increase traffic to your company website and increase sales and brand awareness. Blog on sites viewed by the majority of your target market. In this social media-driven era, those with a large following have a big influence. 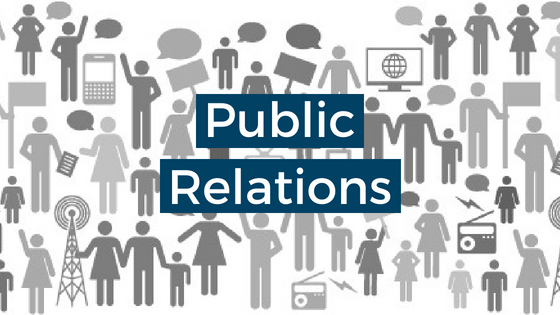 Using Public Relations can establish you as an expert in your industry. A Thought Leader is perceived by a large number of followers as the go-to expert. Thought Leaders push the boundaries on new ideas or old conventional ways. They are risk takers that somehow make others want to follow them. If your thoughts are expressed in a blog and then shared multiple times by those who read it, quite quickly your name and business can go viral. From conferences to local mingles, having a presence at local events is a great way to get your business’s name out there. This may offer unexpected opportunities to meet future clients or partners. Pull up a list of events in your local market where it makes sense to participate as a business. This could be the local farmers market, a trade-show downtown, a college recruitment event or chamber of commerce event. Networking with other businesses could provide other business opportunities for you. Templated emails to the media are not as effect as a personalized message. Adding a touch of personalization to each outreach email will help boost your open rate- and sales! Customers respond more positively when they receive personalized letters or emails. Include the customer’s name at the opening of an email or letter. Using their name makes them feel you know them personally. It says that you are paying attention to them and customers are appreciative. Customers are more willing to hear you out and see what you are offering.